No. 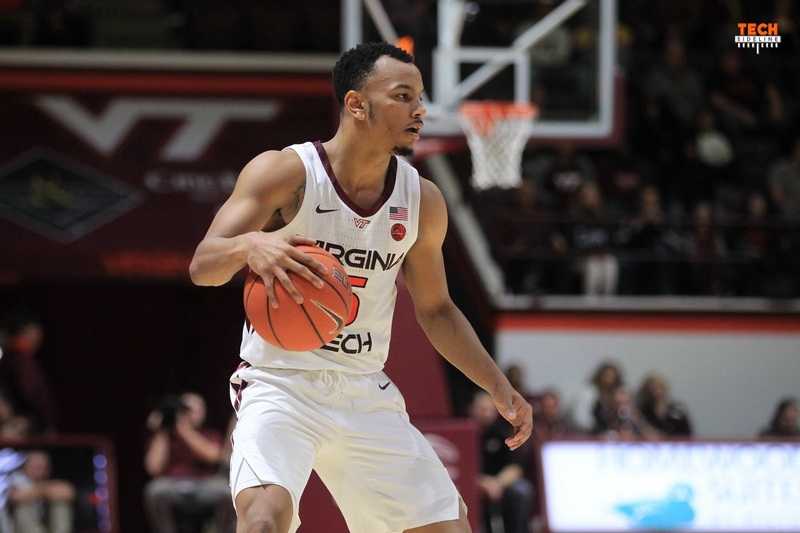 13 Virginia Tech crushed Central Connecticut State 94-40 in Cassell Coliseum on Saturday evening. The Hokies improved to 6-1 on the season with the win, while the Blue Devils dropped to 4-5. Buzz Williams wasn’t happy with his team’s performance in Tuesday night’s loss to Penn State. In that game, the normally reliable Tech offense had just nine assists to 15 turnovers. Williams switched up his starting lineup on Saturday, taking out Wabissa Bede and Justin Robinson and inserting PJ Horne and Isaiah Wilkins. The team got the message and performed much better against a team that, while not particularly good, did play Georgetown to a 7-point game earlier this season. After the poor assist-to-turnover ratio against Penn State, the Hokies had 28 assists on 36 made baskets against Central Connecticut State, and committed only nine turnovers in the process. Justin Robinson led the team with a career-high and school-record 13 assists, and he also grabbed seven rebounds despite scoring just four points. After not scoring against Penn State, senior wing Ahmed Hill led the team with 24 points. He was 9-of-13 from the field and 6-of-9 from three-point range. Joining him in double figures were Kerry Blackshear (18), Ty Outlaw (15) and Nickeil Alexander-Walker (14). Blackshear also had five rebounds and five assists. The Hokies were 36-of-63 (57.1%) from the field, and 18-of-33 (54.5%) from three-point range. The 18 made three-pointers is a new school record, which beat the previous mark of 17 set at Louisville on February 8, 2017. Williams was pleased with his team’s mindset more than anything. “The spirit in how we played was for sure as good as we’ve played all season,” he said. Virginia Tech outrebounded the Blue Devils 37-26 and limited them to just 14-of-54 (25.9%) from the field. The Hokies return to action on Wednesday, December 5 when they host VMI. Tipoff is scheduled for 7pm, and the game can be seen online on ACC Network Extra. The Hokies enter the game ranked 13th in the AP poll and 12th in the USA Today Coaches poll. The Hokies made a new school record 18 three-point field goals in the game. It surpasses the former mark of 17 three-pointers made at Louisville on Feb. 8, 2017. Justin Robinson dished out a career-high 13 assists, breaking the old school mark of 12 assists in a game, most recently set by Robinson at Boston College last season. It is the fourth time he has had double figures in assists in a game. Ahmed Hill scored a season-high 24 points, the fifth time this season he has scored in double figures and the second time he has scored at least 20 points in a game. The 24 points is the second-highest point total by a Hokie this season, behind Nickeil Alexander-Walker’s 25 points in the win over #23 Purdue. Isaiah Wilkins earned the first start of his young career. P.J. Horne earns his second career start and first of the season. Kerry Blackshear Jr., scored 18 points, the sixth time this season he has been in double figures. He also added a season-high five assists. Nickeil Alexander-Walker scored 14 points. He has scored in double figures in all seven games this season. Ty Outlaw scored 15 points. That is his third consecutive double figure scoring game this season. The 94-40 final score marks the 11th time a Buzz Williams-coached Virginia Tech team has scored at least 94 points and the first time this season and the first time since defeating Radford, 95-68, in Casselloliseum on Dec. 6, 2017. The 54-point margin of victory is the most for the Hokies under Williams and the most since Tech defeated Mount St. Mary’s, 99-34 (65 points) on Jan. 2011 in Cassell Coliseum. The Hokies recorded 28 assists on 36 made baskets in the win, good for 77.8 percent. The 28 assists is a season-high and the most by the Hokies in a game since the Hokies had 36 assists on Nov. 12, 2017 against The Citadel, which is the school record for assists in a game. This is the fourth time in seven games this season that the Hokies have recorded at least 20 assists in a game. Yes, I know, but that still looks good to me! Who was the announcer? Considering that he went solo, pretty darn good job and not a bad voice. Think TSL podcast. Our own Evan Hughes. “Casselloliseum” is also a great typo.